Fewins Road still showing the darkened contaminated areas from the dumping of toxic "brine" a month ago, at the time Bryan Black took this photo on July 4, 2013. Photo courtesy of Bryan Black. This time it was in Benzie County, another scenic northern Michigan county where organic farms, fruit orchards, lakes, rivers, estuaries, and Sleeping Bear Dunes National Lakeshore are located. The Platte River Estuary in Benzie County, not too far from the dumping site of toxic wastes on roads within the watershed from the gas fields of Michigan. 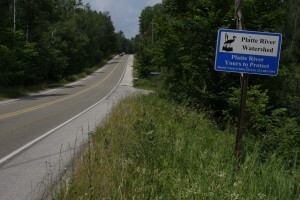 "Yours to Protect": The Platte River Watershed north to Douglas Drive, where the dumping of toxic wastes occurred in scenic Benzie County, Michigan. Photo by Bryan Black. 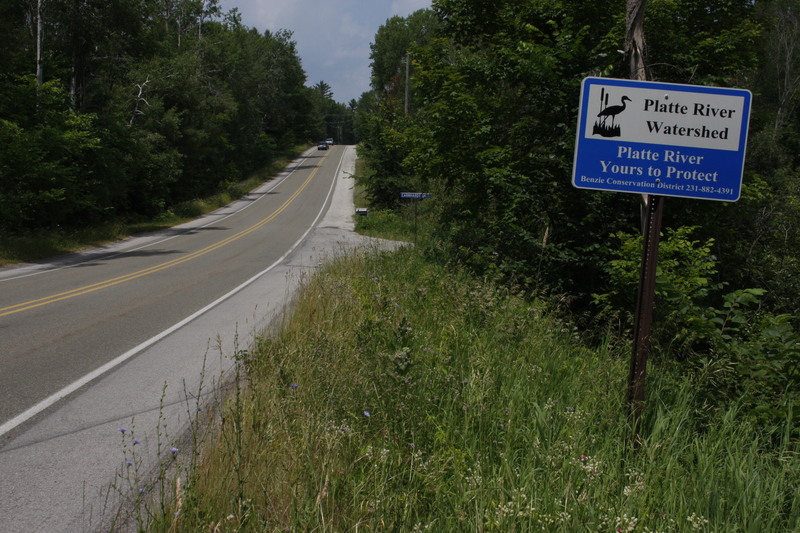 On June 4, 2013, Benzie County residents Karla and Bryan Black contacted Ban Michigan Fracking to report that Bryan witnessed an oil services company truck (Team Services) spreading liquid wastes from a truck on a county road within the Platte River estuary. He witnessed the dumping of “three huge tanker-size loads” and the smell, they said, was horrible. Bryan once worked in the oil industry and knew the smell of petrochemicals well. That evening the Blacks returned to the spot on Douglas Drive where the dumping occurred. It was raining and puddles on the road were covered with a “bubbly, opaque scum.” Their nostrils burned for an hour after visiting the site. The next day, they were still hacking. I’m quite concerned about a situation my husband witnessed yesterday, June 4, at approx. 3:00 p.m. I am requesting you investigate this matter, and respond back to us in writing with your findings. While working on our property that borders the Platte River Watershed, he noticed an oil tanker proceeding north on Lake Ann Road. The tanker geared down, slowed, and turned east onto Douglas Drive, at the top of the hill above the watershed area. Upon investigation, he discovered that they were spraying a substance on the road that had a very obnoxious odor and an oily sheen. Husband talked to a resident of Douglas Drive in the area of the spray, who seemed oblivious to what the oil tanker was doing. He had no knowledge of what was being sprayed, nor given any precautions for his family or pets. The tanker then proceeded south, turned west on Fewins Road, and dumped fluid there, as well. Three tank loads were dispersed on these roads. My husband and I further explored the situation later last night, in the rain. Besides the strong, noxious petrochemical odor which hung in the air, I noticed that the puddles of rainwater that had collected alongside the road were covered with a bubbly, opaque scum. My nostrils burned for an hour last night after our trip down both roads, and this morning both husband and I were hacking — not sure if it is related or not, but it makes me wonder. We are concerned, particularly given the revelation of the 40,000 gallon flow-back spill in Kalkaska and Cheboygan Counties in 2012. I am attaching a copy of the lab analysis of radioactivity in frack flowback from the Excelsior 1-13 conducted last fall, which shows over 2000 pCi/L (picoCuries per liter) each for radium 226 and 228. The EPA limit for drinking water is 5 pCi/L. We are concerned not only about the potential environmental impact from what was spread on our roads, and the impact it may have on wildlife, but the safety of our neighbors’ and our own drinking water. Again, I am requesting you investigate this matter, and provide us with a chemical breakdown of what was in the fluid, where it came from, the reason for the odor, the odor’s expected persistence, the substance’s likely effect on the estuary, river, and lakes that draw from it, as well as the name of the supervisor in charge at the company. I await your response. The County Road Commission got some samples to two labs. One sample was taken from Hulbert and Fogg Roads, the other from Douglas and Fewins Roads. Weeks went by. 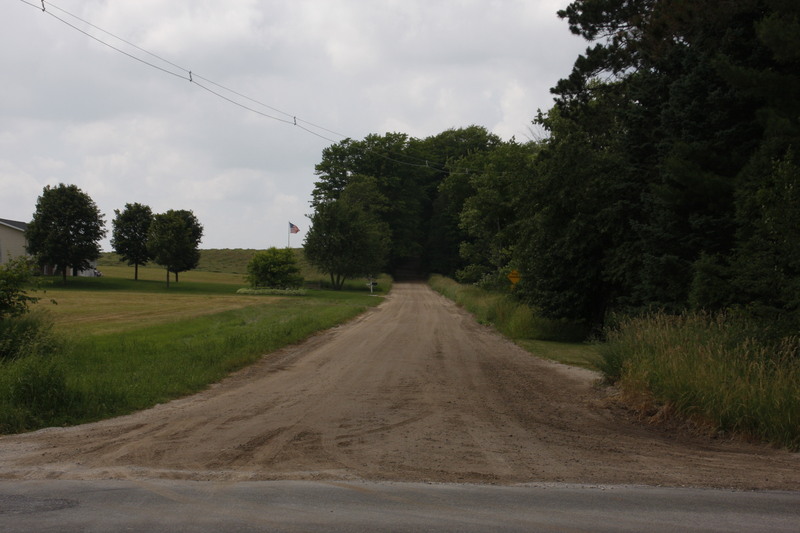 On July 2, the Blacks picked up several documents of the test results (dated June 14 and 18) from the Benzie County Road Commission “including data showing lab values showing what appear to be high levels of petrochemicals sprayed on our roads last month, under the guise of ‘brining.’ … The mix includes Benzene, Toluene, Ethylbenzene, and Xylenes, ” said Karla. There was no indication that the material was tested for radioactivity. Was this really “brine” or something much more toxic, like, drilling fluids? What Bryan Black suspects is that this material, since it was so thick, couldn’t have been “brine” waste but possibly could have been drilling fluids. Was this another approval of toxic dumping by DEQ? The big questions are why did the MDEQ not test this waste material, did they approve it, and what they are going to do about it now? Were it not for the lucky coincidence of Bryan Black witnessing the spreading of this toxic waste, and for the Blacks’ prompt actions through the Benzie County Road Commission, Benzie County residents would not have known the details or perpetrator of this intentional dumping. Perhaps going through the road commission, the Blacks received a more prompt response and test results, but the road commission staff relayed the message from DEQ that this is ‘simply a result of human error,’ and just a fluke. Karla Black reports, “We informed Mr. Schaub that this isn’t the first time that Team Services has done this, and pointed to Kalkaska and Cheboygan counties.” And how many times is this happening without anyone witnessing it? DEQ’s Ray Vugrinovich is in charge of approving “brines” for use on the roads. He pre-approved the dumping of 40,000 gallons of toxic frack flowback on roads in Cheboygan and Kalkaska County in 2012, with no consequences to DEQ, Team Services or Encana, the owner of the well in that case. When the Blacks contacted the Road Commission, samples were provided on June 5 according to the Great Lakes Quality Laboratory, Inc, of Lake Ann, which says it is “MI Dept of Env. Quality Lab No. 0091.” The lab tested for calcium, chloride, conductivity and pH. The customer listed was the Benzie County Road Commission, and the sample was called a “customer provided sample.” The Trace lab, which did the BTEX testing, didn’t receive the samples until June 14 and did the testing on June 18. In a hand-written note by Brad Schaub, he indicates that the results were faxed to Vugrinovich on June 27 as requested by Team Services, and that Vugrinovich called the Commission and “explained that the MDEQ will handle the sampling and testing regarding sample 60549 and Fewins Road and Douglas Rd.” Wait a minute: we thought the Road Commission was the client. The Blacks had to get the documents and test results through a Freedom of Information Act request through the road commission. BMF called Vugrinovich on July 9 and asked him which well the toxic wastes dumped on Benzie County Roads are from. He replied “I have NO idea!” He then blamed the Road Commission for not informing him of the well name. When pressed about DEQ’s obligation to find out the answers, he responded that he has passed the “investigation” on up the line to Rick Henderson and in turn, to field geologist Mel Kiogima. So we called Kiogima on July 10. Our call was the first that he heard of it. He’d get back to us. Yes, that’s right. Three tanker trucks containing high levels of BTEX were dumped in the Platte River Estuary watershed on roads, burning the nostrils of the person who witnessed it, and it took four weeks before the DEQ investigator was told about it–by Ban Michigan Fracking. Test results were in their hands since June 27. Seems to us a major cleanup and heavy fines are in order. With a regulatory agency as captured and doing the bidding of the oil and gas industry as Michigan’s DEQ, we find it difficult to believe anything will be done to right this wrong. 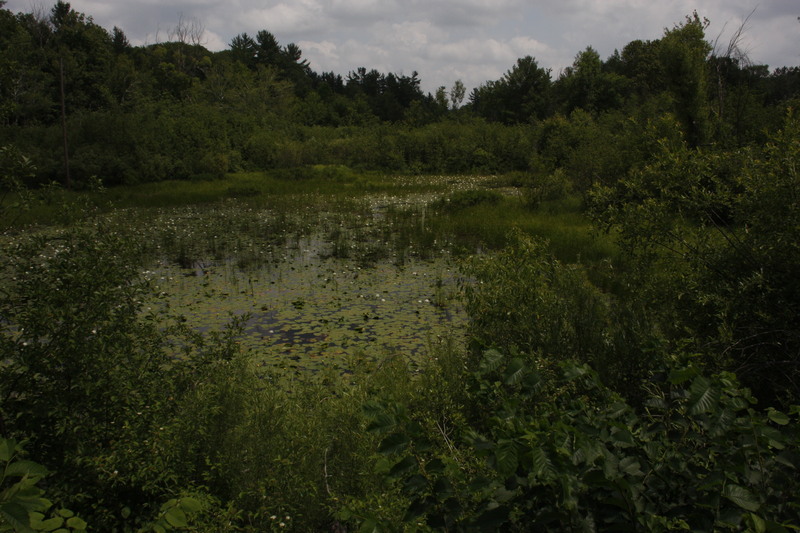 All these wastes produced in Michigan’s gas wells must go somewhere. Millions of gallons of fresh groundwater are used for Michigan’s horizontal frack wells–higher volumes than any other state. Unfortunately, Michigan’s toxic nightmare from horizontal fracking for natural gas has only just begun. The Benzie County Platte River Estuary dumping of wastes containing high levels of BTEX is a forewarning of more to come, a peek at the colossal amount of waste that is being produced and hauled around the state and “disposed of” as a regular part of doing the business of fracking. This entry was posted in Uncategorized by BMF webmaster. Bookmark the permalink.